I haven’t posted for a long time because frankly I haven’t had anything to post. Between the weather and my travel schedule, I have not been riding much at all. My time in the saddle has been dreadfully inconsistent: I think, including tonight’s lesson, I’ve ridden twice or three times in the last three weeks. One thing I have been doing one thing pretty consistently, however, is Pilates. It’s gratifying, because exercises and movements I struggled with at the beginning are becoming easier. In fact, I had a really nice moment last week when one exercise that requires balance and core stability and hip strength [all at once!] was much easier for me – I was able to execute it without losing balance, and losing control of the equipment. With that in my mind, I was really interested to see what effect that would have on my riding. Unfortunately, on Saturday Derby had what I call a “bad air day.” On bad hair days, he has difficulty getting his breath because he flips his palate and then has trouble (I’m surmising) getting it back in place. These days are characterized by a complete lack of gas in the tank and extreme mouth fussiness. He can get his tongue over the bit as he works his mouth, trying to rectify the palate problem. It can be really difficult to have a quality ride on that air days, because he doesn’t seem to really work out it. I am patient on these days, and we did have a few nice moments here and there of nicely connected trot, and I was happy with that. You do what you can with what you got on any given day. 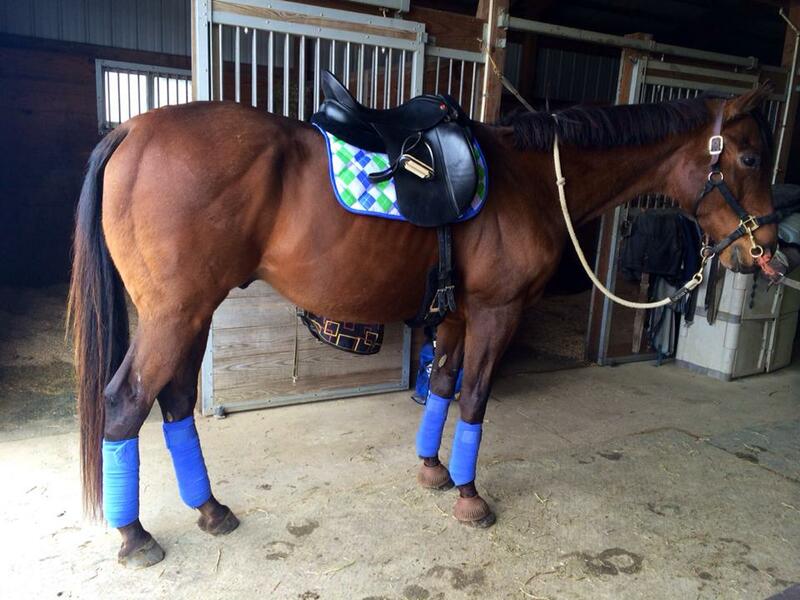 And we looked cute: we had a new saddle pad and our matching periwinkle polos! Tonight was a different story. Derby so great, and we are both ready for a lesson. I’m doing a better job of not immediately going to my hands to correct issues I perceive I’m having with Derby. 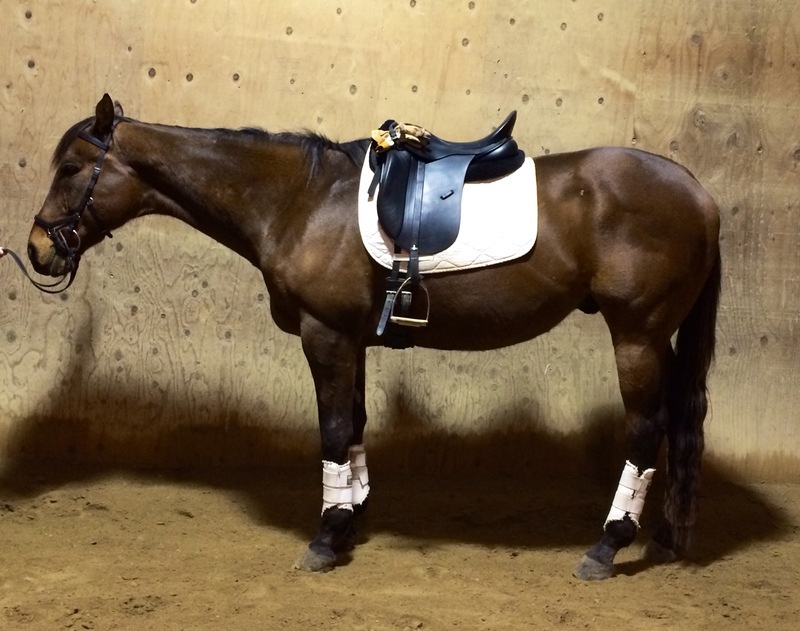 Instinctively, I’m much more likely now to try to maintain “side reins” with my hands, and use my seat and leg to fix the problem I’m encountering. Tonight we expanded on that, with Christy asking me to “lengthen” at the walk and trot. In our current state of fitness, not too much lengthening is happening, but really, the point of her reminder is to tell me to close my legs, engage my core and ride forward. I also need to remember to swing my hips to my hands, (not vice-versa) – that helps keep my hands steady. Moving into the trot, things were promising from the get-go, Derby was breathing and I was managing to put things together. Some trouble did appear as we started to practice riding deep into the corners on the short sides, and then lengthening down the long side. As I was approaching the corners, I was tending to collapse. Essentially, I would lose my base of support, collapse through the inside hip, and flail ineffectually with my inside leg trying to get the horse to been through the corner. As you might suspect, that doesn’t work very well at all. The memory device we use the corners is “pirouette seat” — obviously, we’re nowhere near during the doing pirouettes in any way, shape or form, but we use the phase as as sort of mnemonic device, as a reminder to maintain strength through my hip and leg, attaching it to my core, given the horse something to bend around. Anyway, it might sound silly but it works for me. 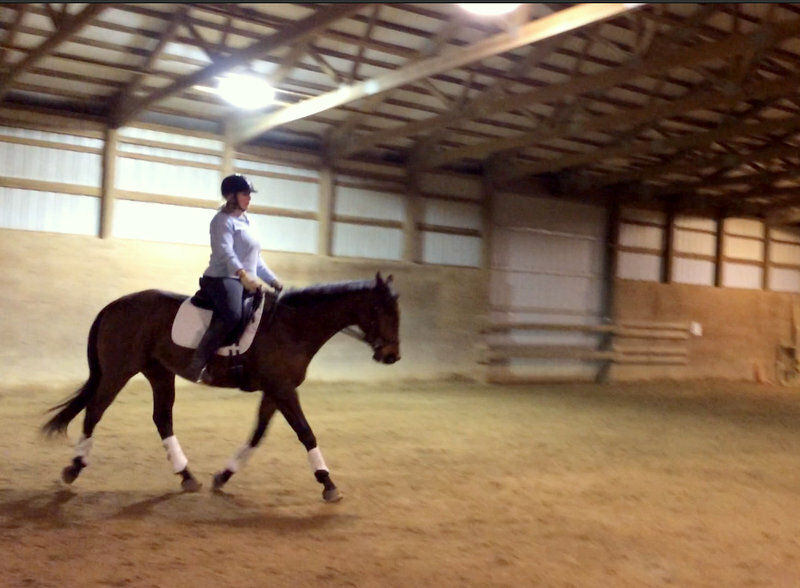 And I actually do have a mental image of a Grand Prix rider sitting deep and leading with a hip in a perfect pirouette in my mind whenever I hear Christy’s reminder, In fact, now that I think about it, there’s a half off in there too, isn’t there. So we have some video of the work tonight and I’m sharing it with you here. It doesn’t look like much, but what it reveals is much better work on my part, especially in maintaining some connection and engaging the horse’s hind. 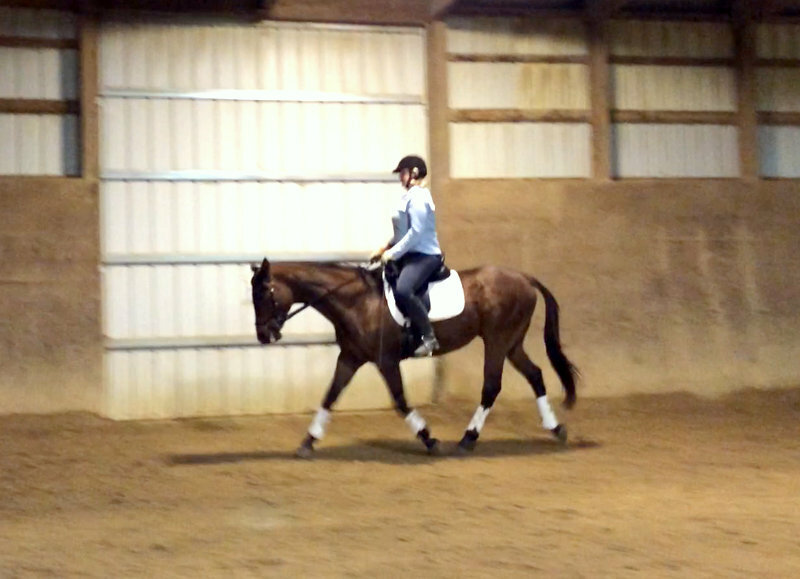 It certainly felt good, and when Christie had me doing some circles and diagonals, they would ride really easily. The degree of control I have is significantly greater, and I feel like I can be so much more precise and make communication of course Christie made a comment with much the same sentiment: telling me that it was clear I had access to my body parts and could control them in order to give the horse clear aids. It was an enormously gratifying lesson. Derby on 3/17. He’s looking pretty out of shape. That’s what 4 months of woefully inconsistent work and limited turnout will do to a boy. Before I got on, I also snapped a picture of Himself. Where has our neck gone? Ugh. I’m glad this winter is about over (and no, I’m not capitalizing it because I don’t want to give it any sort of respect) and we can do some consistent work! What is a “pirouette seat”? I thought I explained it in the post, but in a nutshell, it’s a reminder to me to engage my core, keep my inside leg solid and strong, and feel like I’m lifting the withers with my inside hip. The visual I have in mind is of a GP rider doing a pirouette. It’s a simple way for Christy to remind me to do all of the above, married with a visual that I carry that helps me execute. Im loving all of the video footage, its great. Btw, what kind of boot is he wearing here in this photo? Brand? I want a pair lol.